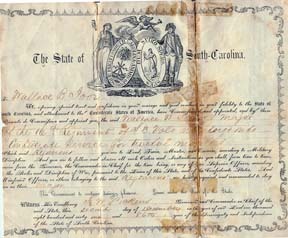 Major Wallace B. Ioor's commission as "Major of the Sixteenth Regiment of S.C. Vols. mustered into Confederate Service for twelve months," signed by Governor F.W. Pickens and Colonel Elford on the back. Dated December 2, 1861. To the left is a photo of Major Ioor taken later in life. Below he wears a typical enlisted man's nine button frock with quarter inch piping. 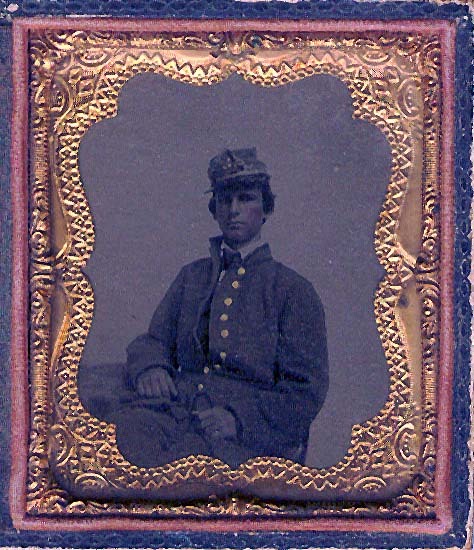 Unusual on an officer, the jacket is typical of South Carolina troops early in the war. All documents and photos were graciously furnished by the family. Thanks to W.C. for the uniform description. W.B. Ioor (Ivor) was elected Major and later Lt. Colonel early in the history of the regiment. He was frequently on medical leave and rarely appeared in the field. The following was provided by russell@csranet.com. "Please note that the lieutenant colonel of the regiment was named Wallace B. IOOR, not IVOR. That was a misspelling that slipped into OR and has been perpetuated. If you look at Ioor's service record you will see the correct name. Ioor is a name of presumably Dutch origin. Wallace Ioor's father was a Charleston author and playwright who moved to Greenville for a simpler, less expensive life style and perhaps to escape his creditors. There's more info about the family at the Caroliniana Library at the University of SC. Wallace Ioor was a major of militia before the Civil War and there is some slim evidence that he worked as a railroad conductor to make ends meet." The following was furnished by Rick and John. "A few other things that I have found out about Mr. Ioor is after the war it is believed he went back to his farm at either Myrtle Beach or Hilton Head. There are some questions as to which. He never married. He died as a young man as a result of some kind of farming accident resulting in blood poisoning." My thanks to Rick Willis and John Stanley and all the others who have furnished this information. There is a good biographical write-up on Wallace Ioor's father William Ioor (4 January 1780-30 July 1850) in the Biographical Directory of the South Carolina House of Representatives, Volume IV, pp. 305-6. Among Wallace's siblings was a William Ioor, Jr. The Biographical Directory says that this William was born in 1809 and died in 1863. He is apparently the Col W.B. Ioor who is buried in the Waring family cemetery near Summerville. The tombstone says that Colonel W. B. Ioor was born 25 April 1809 and died 21st June 1853 leaving a widow. The widow apparently was Mrs. Cornelia H. Ioor, who was born 26 Nov. 1813 and died 19th June 1854. The good ladies who copied these tombstones evidently found worn inscriptions and wrote down 1853 and 1854 when the actual dates should have been either 63/64 or 83/84. That's my speculation. If they have copied the name accurately, the tombstones may complicate some of the oral history you have received. It seems to me that Wallace Ioor was probably born by 1820. He was therefore not "young" (according to my definition) in 1865. It is doubtful that his farm was in the close vicinity of Hilton Head. All the sea islands in that area were occupied by federal troops early in the war and they gave the land to the freed slaves. It has taken decades to get clear title to land on Hilton Head and Daufuskie. The legislature finally had to create clear titles on Daufuskie. I doubt that Wallace Ioor merely returned to this area and took up residence. In addition, I have no evidence that the Ioor family held real estate either near Hilton Head or Myrtle Beach. The Ioor family had one or more plantations in St. Georges, Dorchester, Parish northwest of Charleston for decades. The parents of William Ioor (1780-1850) were John Ioor and his wife Elizabeth ____. The Biographical Directory says her maiden name was Bradwell, but I have seen no confirmation of this. John Ioor was born in April 1740 and died on 19 December 1790. This John Ioor was the son of John Ioor, The birthdate of the father has been transcribed from his tombstone (erroneously in my view) as July 1722. He reportedly died on September 4 or 15, 1772, although the tombstone says September 12, 1772. This information comes from a book entitled "A South Carolina Family: Mills-Smith." It is available in Columbia, Charleston, Savannah, the Library of Congress, and other libraries. It contains some inadvertent errors, but it is a no-nonsense family history.